>Blog>Can You Really Overdose On Weed? Can You Really Overdose On Weed? Cannabis went from the devil’s weed to the first line defense against cancer - which highlights the fundamental question about its safety. The first thing a new user of any drug should be concerned about is its safety profile. Any indeed many new cannabis users are having this question in their minds - it is possible to overdose on cannabis? To make it short: No, you can’t. The slightly longer answer is: No, you can’t die from an overdose, but having too much isn’t a particularly pleasurable experience - however, there is no lasting damage. Any substance in high enough quantities becomes toxic for your body, even water. It takes about 8 liters of H20 to kill an adult. That’s the basic rationale some anti-cannabis activist use to twist words and state marijuana can kill you; but that doesn’t work with cannabis: There is no humanly possible way to consume enough cannabis fast enough for it to become toxic, as a consequence it is impossible to fatally overdose. There have been no recorded deaths ever as a direct result of consuming cannabis. Not one ever. To give you an idea of how impossibly hard it would be to overdose on cannabis, let’s look at marijuana’s LD-50. The LD-50 (Lethal Dose) is a medical term used to describe the dosage of a drug that would be required to cause 50% of the test animals receiving it to die. Of course, many scientists have tried to establish the LD-50 of marijuana, however, with absolutely no success. To put it simply, no matter how much marijuana scientists administer to animals, they never die. 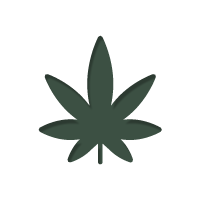 It is estimated that the LD-50 of marijuana is between 1:20,000 and 1:40,000. What this means is that a human would have to use some 680 kg of cannabis bud in the space of 15 minutes for it to be lethal – something we think even the most willing stoner would find hard to achieve. A recent study has recently come to light explaining the science behind the impossibility to OD on cannabis. Published in the journal Science, this French based research found that when exposed to THC, the brain rapidly increases the production of pregnenolone, a hormone that seems to counter marijuana’s intoxicating effects. Basically, when THC binds to our cannabinoid receptors, it triggers a 3,000 percent increase in pregnenolone production. This in turn dampens the effects of THC on the cannabinoid receptors, creating a negative loop which prevents the body from becoming toxic, as well as reducing the capacity for addiction. It is for this reason you would need to consume an unrealistic amount of cannabis in a very short amount of time to have any chance of it actually posing a risk to your life. What about recent reports of a British woman dying from cannabis poisoning? There are some media outlets in the UK, especially those that have a reputation for fear mongering, that have been quick to jump on reports that a woman has supposedly died from cannabis poisoning after smoking half a joint. This flies directly in the face of decades of hard evidence and research that have proven such a thing is impossible. The post mortem could find no natural cause for her death, and cannabis was found in her system, so in an act of kindergarten science, the coroners concluded that this must be the cause. Since then, many doctors have weighed in, all of them stating it would be impossible for her to have died under such circumstances. It is thought by many medical professionals that the death could have been potentially caused by an underlying heart condition. Just because you cannot die from an overdose doesn’t mean you cannot consume more than is pleasant. Consuming too much can cause dizziness, sweating, nausea, a racing heart, and panic. When smoking or vaping, this very rarely happens, but edibles have a reputation for quickly leading up to too much. Edibles take a while to kick in, which is why some users keep eating more, believing the brownie doesn’t work. Once the high hits, a substantial dose has already been ingested. If you ever find yourself floored by weed, try to remain calm and remember that cannabis cannot be fatal and cause no injury to your organs. Have a glass of orange juice or vitamin C, which has been experimentally shown to help sobering up faster. Also, some food will redirect the blood flow and help to calm down. Then, go somewhere quite, chilled and try to go to sleep. If you are at home, curl up in bed and turn the lights off, after a few hours the effects will have worn off.